CHICAGO (Sporting Alert) — LeBron James hit a buzzer-beating jumper to lift the Cleveland Cavaliers to an exciting 86-84 victory over the Chicago Bulls to tie their series 2-2 on Sunday. With the scores locked at 84-84 and 1.5 seconds remaining in the game, James, who scored 25 points, 14 rebounds and eight assists, connected on the last shot of the game to seal the win for the Cavs, who went just 5-of-25 from three-point range. “(I told Matthew Dellavedova) give me the ball and I’m gonna win this game for us,” James said. “I’ve made big shots before in the postseason. Timofey Mozgov finished with 15 points, nine rebounds and J.R. Smith hammered down three vital 3-pointers to finish with 13 points off the bench. Tristan Thompson and Kyrie Irving each scored 12 points with the former also grabbing seven boards, while the latter was only 2-of-10 from the floor. Derrick Rose paced Chicago with a game-high 31 points, while Jimmy Butler added 19 points for the Bulls, who were without power forward Pau Gasol because of a hamstring strain. Rose and Butler were the other two players to score in double-digit for Chicago on Sunday. It’s halftime in Game 4 between the Chicago Bulls and the Cleveland Cavaliers and hosts are leading 49-45 at the United Center. LeBron James so far has 13 points, seven rebounds and four assists, while Tristan Thompson and Kyrie Irving each have 10 points. Derrick Rose is leading the Bulls with 15 points on 6-of-10 shooting, while Jimmy Butler has 11 points. The Chicago Bulls are leading the Cleveland Cavaliers 28-26 at the end of the first quarter in Game 4. Chicago is shooting 52.2-percent from the field on 12-23 attempts, with Derrick Rose leading the way with nine points first quarter points. They are also 2-of-4 from three pointers. LeBron James has nine points, four rebounds and three assists for the Cavs, who are shooting 52.4 percent from the floor, but struggled to get stops. Cavaliers coach David Blatt was happy with the offense of his team, but he wasn’t trilled about the defending. “We’ve got to defend at a higher level,” Blatt told ABC reporter. “A 28 point quarter is not good enough. CHICAGO (Sporting Alert) — The Chicago Bulls are hoping to take Game 3 momentum into Sunday’s Game 4 Eastern Conference semis series against the Cleveland Cavaliers at United Center. Derrick Rose hit a buzzer-beating three-pointer to give the Bulls a 2-1 victory in the third game of the series on Friday night and the hosts will now try to extend their lead in the battle. Rose scored 30 points, seven assists and seven rebounds in Game 3 win. Chicago will have to go to work without its star power forward Pau Gasol, who misses the game with a strained hamstring. Gasol, who was averaging 15.1 points per game and 9.9 rebounds per game and shooting 49.5 percent from the field this postseason, injured his left hamstring in Game 3, which the Bulls won 99-96 and the team confirmed that he hasn’t recovered to feature. “He’s still sore,” Bulls coach Tom Thibodeau said. This means Taj Gibson, who average 7.9 points and 5.7 rebounds per game in this postseason, has been selected to take the place of Gasol in the starting lineup. 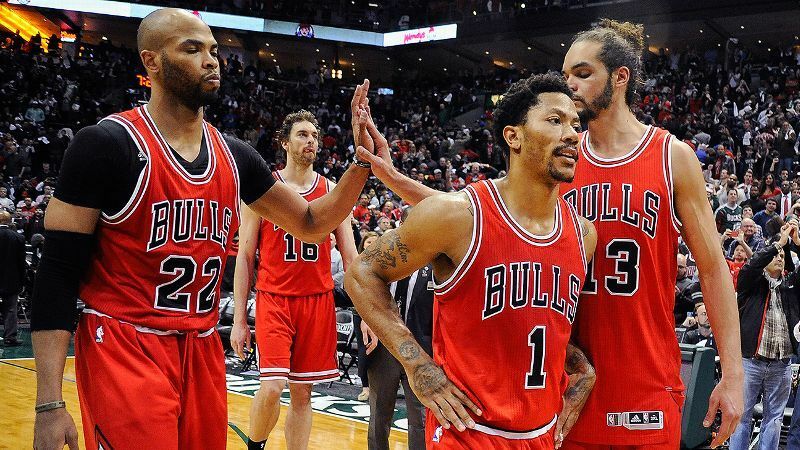 It will be the first time the current Bulls starting five of Rose, Jimmy Butler, Mike Dunleavy, Gibson and Joakim Noah will start together. The Cavs, in the meantime, will keep Iman Shumpert as a starter with J.R. Smith starting on the bench again. Chicago will be trying to take a 3-1 lead in the series after Game 4, which will be live on ABC at 2:30 p.m. CT. The Bulls are 18-3 all-time when they are leading a best-of-7 series 2-1.